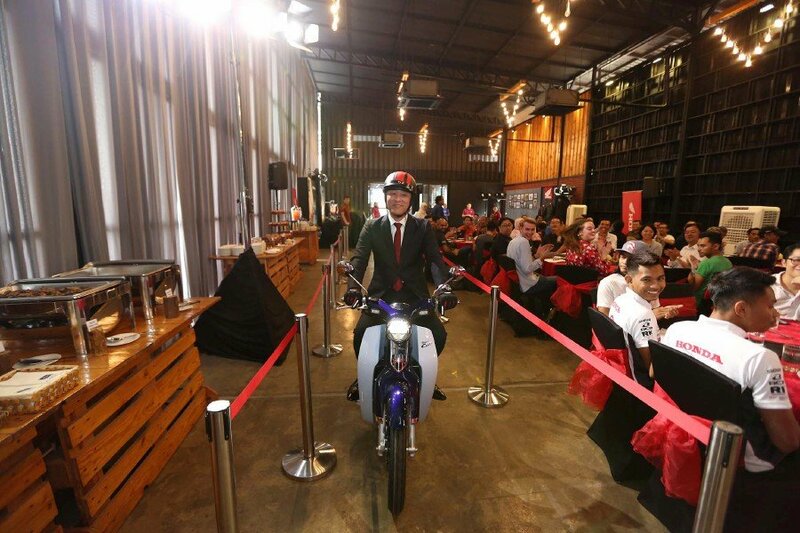 MD and CEO Keiichi Yasuda riding the Super Cub C125 into the event before delivering his speech. BOON Siew Honda (BSH) sold 156,000 units of motorcycles last year, a 28.7 per cent increase compared with 2017. The impressive sales performance sees BSH gain four per cent additional market share, up to 30 per cent of the Malaysian motorcycle market. BSH attributes its success to the introduction of 12 new models and three upgraded models last year. They also launched two Honda BigWing showrooms and five Honda Impian X showrooms offering next-level sales experience to itscustomers. The CB-RS is available in Darkness Black Metallic or Matt Beta Silver Metallic with a price tag of RM75,999. Leading the sales figures were the RS150R and Wave Alpha models with 43,948 and 36,895 units sold respectively. BSH has set its eye on being the leading motorcycle brand in Malaysia. To achieve this, BSH outlined five key strategies: brand enhancement, improving dealer network, improving after-sales, expansion of safety riding and development of local riders in motorsport. Brand enhancement is basically the launching of new, sportier models to meet the rising demand from the younger generation. BSH will improve the dealer network by launching more BigWing and Impian X dealers, which will improve the quality of service. Better training for Honda technicians in 251 service centres and establishing a new service centre in their Penang factory will improve after-sales quality. Safety Riding has always been BSH’s concern and BSH will continue to advocate the importance of road safety as well as working closely with government agencies to that effect. Finally, development of local racing talent sees BSH fielding Zaqhwan Zaidi in the Asia Superbike 1000cc class and joined by Azroy Hakeem Anuar and Helmi Azman in the SuperSports 600 categories in the Asia RoadRacing Championship. To underline its commitment to the Malaysian motorcycle scene, BSH launched three new models to start off 2019. Interestingly, each model is a flagship in its respective categories, underlining BSH’s commitment to the big bike market in Malaysia. First up is the SuperCub C125. Drawing upon its 60 years of history, the SuperCub is a modernised version of the iconic original. Powered by a 125cc, air-cooled, fuel-injected four-stroke single, it produces 6.79 kW horsepower @7.500rpm and 9.98 Nm of torque @5,000rpm. The styling is definitely retro, but the modern LED lighting and Honda SMART key system mean modern amenities, such as a remote seat lock, electric starter, telescopic forks and front disc brake. Three colours are available - Pearl Niltava Blue, Pearl Nebula Red and Pearl Shining Black - with a retail price of RM13,999. The second flagship model is from the naked retro category, the CB1100RS. Also harking back to the past, the CB-RS takes its cues from the seminal CB750 Four, undoubtedly the first superbike in the world. The timeless silhouette is brought right up to date with modern underpinnings and sharper styling. The fuel tank is seamless, meaning it does away with traditional steel tanks with lips around the edges. The lights are LED throughout although they are in classic-looking casings. The horsepower comes from a 1140cc air-cooled DOHC 16-valve inline-four with 89 hp 7,500rpm and 91 Nm @5,500rpm. Up front, the CB-RS is suspended with a Showa Dual-Bending Valve (SDBV) front fork and the rear duties are handled by twin Showa remote-reservoir shocks. Further modern touches are lightweight 17 inch cast aluminium wheels, dual radial-mount four piston calipers and ABS braking. The CB-RS is available in Darkness Black Metallic or Matt Beta Silver Metallic with a price tag of RM75,999. Last but not least is Honda’s full-frontal Superbike, the CBR1000RR Fireblade SP. The last two letters underline the pedigree of Honda’s ultimate supersports machine. Compared with the “ordinary” Fireblade, the SP offers greater riding performance, lighter weight and is equipped with better technology. Taking Honda’s “Next Stage Total Control” to its ultimate level, the SP is equipped with Ohlins Smart Electronically Controlled suspension front and rear, the first Honda to be so equipped (the front is a NIX30 and the rear a TTX36). The brake system is all Brembo and rider aids include all that the ordinary Fireblade possesses (riding modes etc.) and add on a quickshifter and cornering ABS into the mix. The 16litre titanium fuel tank is the cherry on top. Incidentally, the 1000cc liquid-cooled DOHC inline-four punches out 141 kW@13,000rpm and 114 Nm@11,000rpm. It comes in one colour option - the tri-colour red, white and blue - Honda’s racing colours.